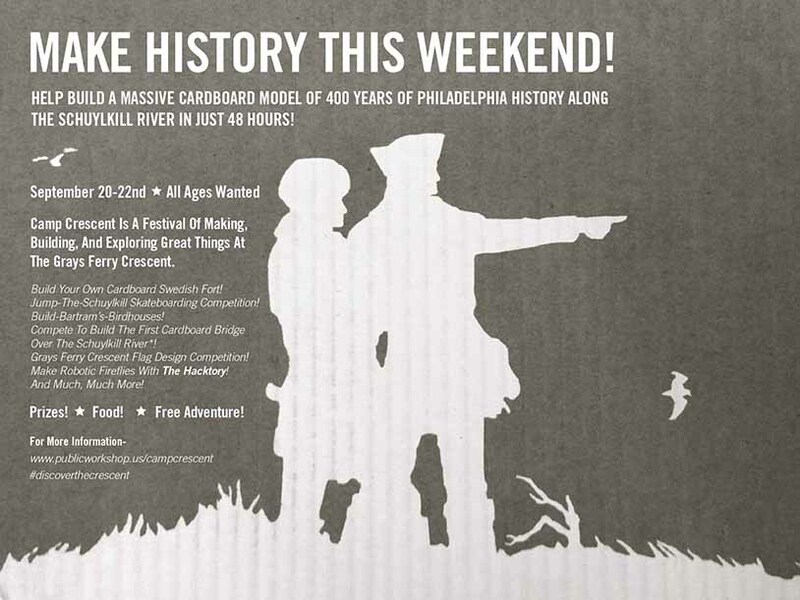 HELP BUILD A MASSIVE CARDBOARD MODEL OF 400 YEARS OF PHILADELPHIA HISTORY ALONG THE SCHUYLKILL RIVER IN JUST 48 HOURS! CAMP CRESCENT! is a festival of making, building and exploring for all ages at the Grays Ferry Crescent that uniquely engages nearby community members and park visitors in investigating and celebrating the rich history and vibrant natural assets of the park. Taking place September 20-22nd, community members, school groups, park visitors, and existing users will explore and celebrate the Grays Ferry Crescent by building cardboard models of the forts, buildings, bridges, and development that shaped the Schuylkill River and Philadelphia’s history. Throughout the weekend there will be complimentary events, challenges and activities–such as a Jump-The-Schuylkill Skateboarding Competition, Grays Ferry Crescent Flag Design Competition, Build-Bartram’s-Birdhouses!, and Make-Your-Own-Robotic-Firefly—that celebrate unique moments and features along the River’s history. The building festivities kick-off at 6.00 pm on September 20th at Camp Crescent in the Grays Ferry Crescent Park with the building of the Dutch and Swedish forts that dotted the area in the 17th century. By 6.00 pm Sunday afternoon, participants of all ages will have constructed a massive, spectacular model of 400 years of development, engineering innovation, and Philadelphia history from everyday pieces of cardboard and be exploring a new future for the Grays Ferry Crescent and the Schuylkill River. No particular skills, knowledge, materials, or tools are necessary to participate. Snacks will be provided throughout and prizes will be awarded for the various competitions throughout the weekend as well as the most prolific builders–Building Heroes!–who log the most hours helping build Philadelphia’s history. This unique approach to placemaking is being organized in collaboration with the great folks at the Schuylkill River Development Corporation, Second Muse, and The Hacktory with the support of the William Penn Foundation. Sign-Up For The Event On Facebook! Download The Schedule Of Events And A Map For Camp Crescent Here! Interested In Helping Out, Bringing A Group Or You Want More Information? If your school or organization is interested in ‘Making History’ at the Crescent or you’d like more information, please contact katey.metzroth@secondmuse.com or 646.270.2439. Park entrances are located at Grays Ferry Avenue and the FedEx driveway (approximately 36th St.), Schuylkill Avenue and Wharton Street, and off of the 34th Street/University Avenue Bridge. Find a map here.